Story: Mi-hee (Kim Yoon-jin) is accused of having killed her husband (Jo Jae-yoon) and her son Hye-je (Park Sang-hoon). However, her son's body has never been found. Mi-hee goes to jail for the next 25 years and is only released because of cancer. She returns to her old home where she is still under observation by the police. Still, the last 25 years she has waited for this day because now she can finally find out where her son is. After all, the mother has neither killed her husband nor her son. Her son has rather been pulled into a room in the house's basement by an unknown force right in front of her eyes. Behind that very door is nothing but a wall, though. Mi-hee finally wants to find out what lies behind it. Moreover, she isn't alone in the house. She constantly sees ghosts. 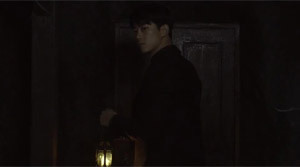 In the end, she is visited by priest Choi (Ok Taec-yeon) who believes her that she is no murderer. He investigates and finds out that every 25 years the family living in that very house has vanished under mysterious circumstances. Now the time has come for the door in the basement to open again. Mi-hee believes that she will finally be able to find her son. Review: It has been a while since a horror movie coming out of Korea is worth mentioning. "House of the Disappeared" may not play in the same league as let's say "The Wailing" from last year, yet attempts to bring a fresh breeze into the genre. And this even though everything looks rather familiar at first. However, what the movie instantly manages to score with are the sets, most importantly the old house, as well as the lighting and the editing. In those departments, everything is done just right and it's not just once that you feel reminded of the American flick "The Conjuring". What this Korean horror movie does better than the - in my opinion overrated - flick is that there are a few interesting ideas which will make you wonder if this is actually a horror movie at all. The jump-scares will definitely prevent you from doubting that, though. We are thrown into the action with the very first frame and then wonder why suddenly 25 years pass and an aged protagonist leads us through the movie. Of course, the movie is also told in flashbacks. The two different time lines are connected very well, though. The editing is excellent and you never get the feeling that the story lingers in one time line too long. The pacing is well done, too. Apart from that the horror moments are well captured. They may not deserve to be called innovative and the ghosts aren't depicted as pale and disfigured as we are used to see in movies of this genre - and there even is an explanation for that - yet the horror elements are implemented effectively. This is particularly the effort of a very tense atmosphere which gets its foundation thanks to nice sets. After all, director Im Dae-woong has already gained some experience in the genre with his "To Sir with Love". However, there are problems with the makeup. 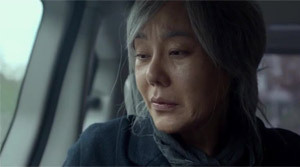 Kim Yoon-jin ("Ode to My Father") manages to convince acting-wise, but her physical infirmities sometimes may seem unintentionally funny, since her make-up doesn't truely make her look that much older. In close-ups the wrinkles in her face create a well achieved illusion, but when the camera zooms out her skin looks too young, her hair synthetic like a wig and particularly her eyes are too clear. Another problem is that like in so many other horror movies it's hard to sympathize with the protagonist. And this even though in the story told here this actually would have been achieveable. Accordingly, the drama hardly works either. All in all director Im can't avoid making some of the mistakes which are so typical for the genre and as already said this is even odder since he in fact also tries his hand at some new stuff. Then there is Ok Taec-yeon, rapper of boyband 2PM and actor of several drama shows for some time now. It's strange that his priest doesn't play a more important part in the film. He mainly serves the purpose of uncovering the mystery through research. Because Mi-hee apparently decided to leave prison after 25 years and aimlessly search for her disappeared son in the house. How hasty her actions really are becomes obvious in more than one scene, particularly when she gets the chance to convey a message to someone. But you can't truely blame the script for this since this almost crazy procedure of her was probably intended. But then again it is disappointing that Mi-hee's mind isn't explored some more which would have given the movie more depth, after all. An especially strong scene is the one featuring a shamanistic ritual which shows in which direction the movie could have gone had it aimed for being a little bit more intense as a horror flick. But things turn out differently. The big twist is interesting, although not what you might have expected. But that's exactly what these kinds of movies are about, isn't it? It's just a shame that those who understand the Korean title will barely be surprised by the mystery's resolution. It's strange to take away so much with your title. The more inconspicuous English title is actually a better choice. Towards the end the focus shifts a bit too much anyway. Despite this the movie still remains interesting and the house creates just the right creepiness. Maybe this rating turns out somewhat forgiving, but measured by the standards of other Korean horror works this movie is definitely recommended.